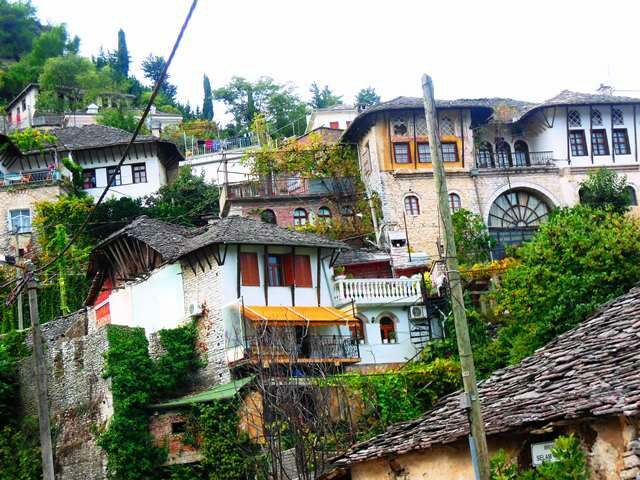 Our furgon (minibus) arrived in Gjirokastër, Albania in the lower part of town and since we didn’t have a map and the old city is built on a steep hill we took a taxi to our guest house. When I say we took a taxi I mean we paid a guy who was using his unmarked personal car to tote people up the hill. The driver started winding up the narrow cobblestone streets on a sharp incline and on learning that we were American tourists announced this information loudly to whomever he stopped to ask for directions, as in “I’m got a couple of Americans in here!” and when he pulled up to our destination he jumped out of the car and pounded on the door to the guest house yelling “Your American tourists are here! Open up!” Albanians for the most part are rather low key and reserved except for occasions like this when they seem to be imitating their Italian neighbors across the Adriatic. 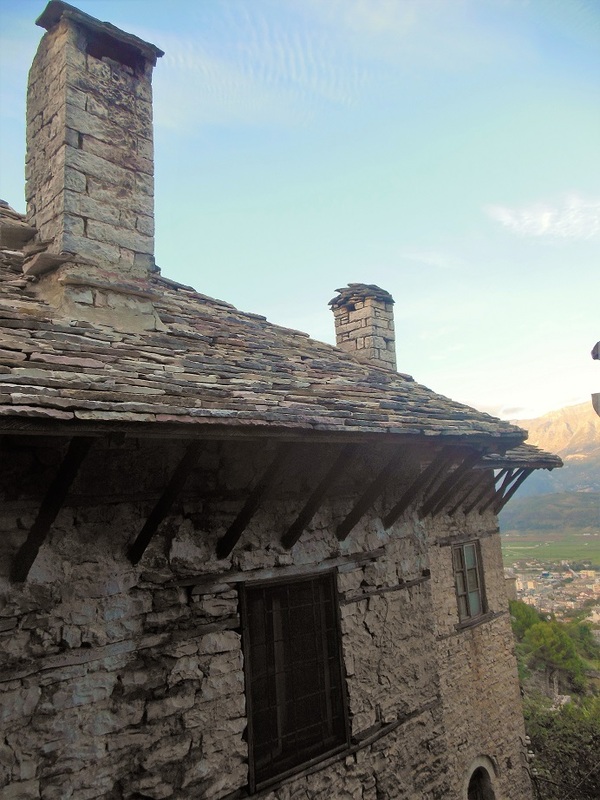 Our guest house gave us a great taste of Gjirokastër’s traditions and architecture. 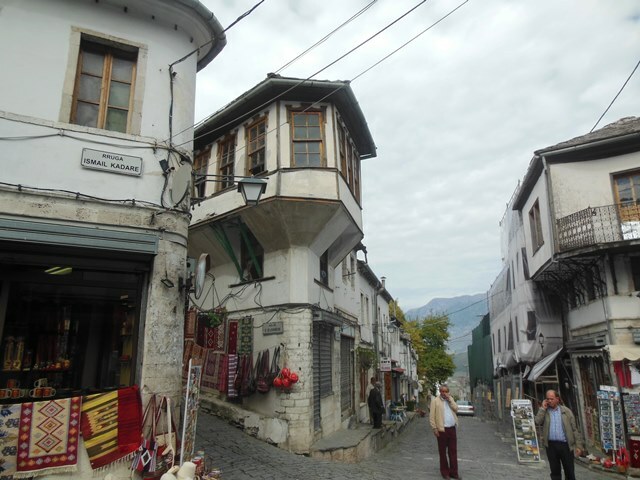 The owner told us the Ottoman era house is 370 years old and I believe him, having noticed the way stone stairway to the upper floor is worn down from use. While we were snacking on a pomegranate and gawping at the astonishing view, the owner’s 8 year old son came over to chat (in perfect English which he taught himself using the internet). He claimed, among other things, to be moving to Switzerland “forever” in a few months. If all the children of Gjirokastër are this smart and adorable, the future of Southern Albania is bright indeed. 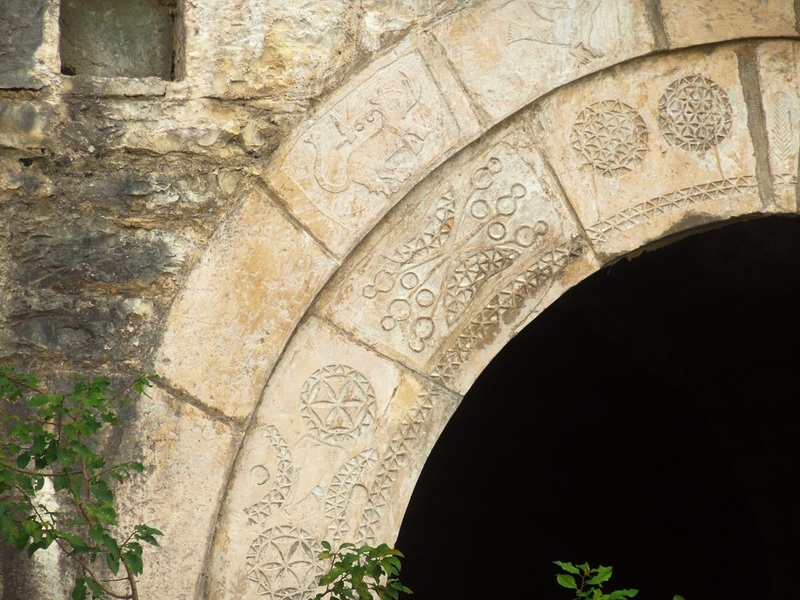 The carvings over the original entrance to the house are unique—I think the star shape inside the circle is a stylized pomegranate symbol, which is a common motif in Albanian décor. An elephant? In Albania? WTF! The interior of the guest house. 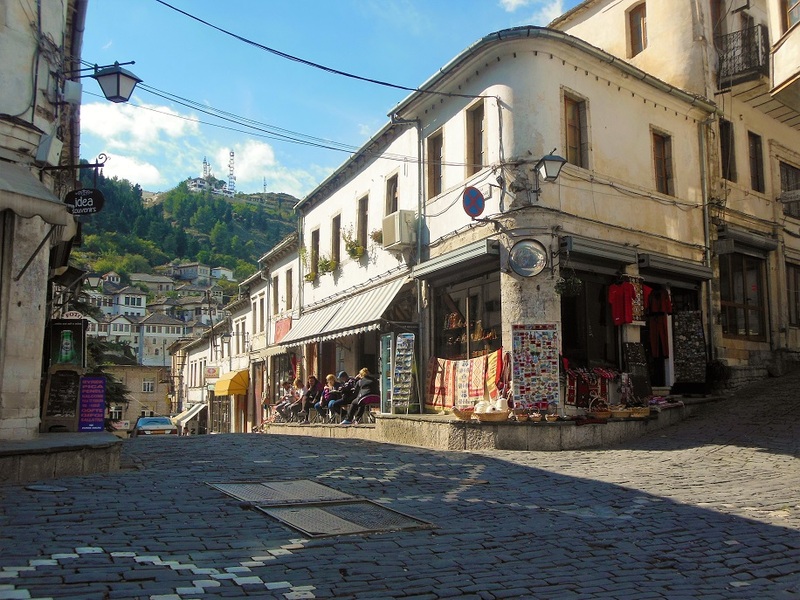 Gjirokastër’s is very much a living city and though the houses jumble down the hills picturesquely, the town is not pimped out for tourists and it doesn’t feel like a museum either. The 19th century Ottoman bazaar is straight out of a pre-Raphaelite orientalist painting. (I pretend to scorn pre-Raphaelite orientalist paintings but just between you and me I actually find them quite compelling). 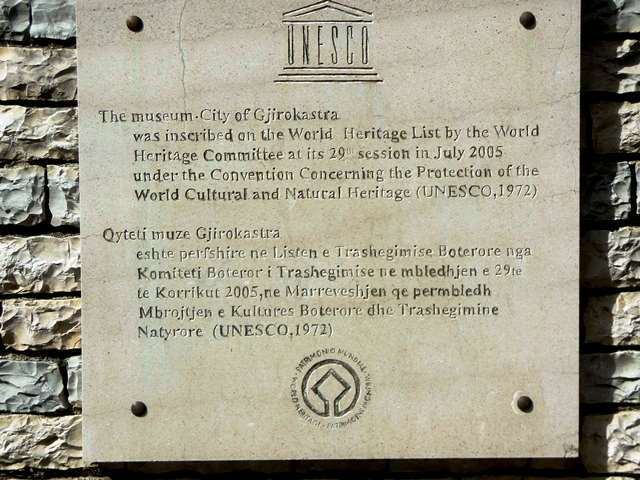 UNESCO has designated Gjirokastër as a World Heritage Site—-excellent choice UNESCO! People dined on small tables under awnings. We were tempted to join them but stuck to our regime of tomato, cucumber and byrek picnics. 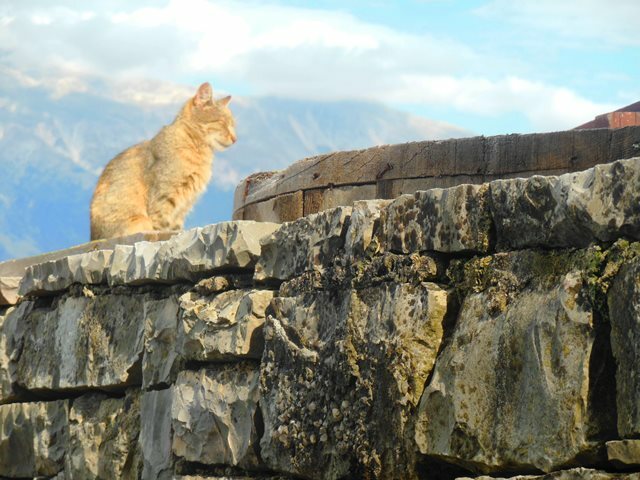 Gjirokastër has four historic neighborhoods and we hiked through all of them, past dozens of grape arbors, children managing to play ball on the steep road, fruit stands, pretty but standoffish cats and the occasional herd of sheep. 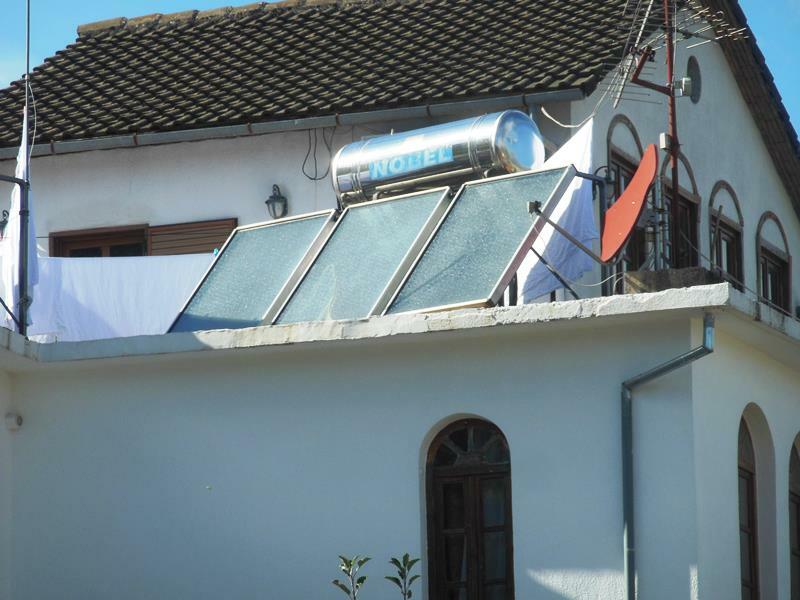 Many houses had solar panels attached to a roof top hot water heater. 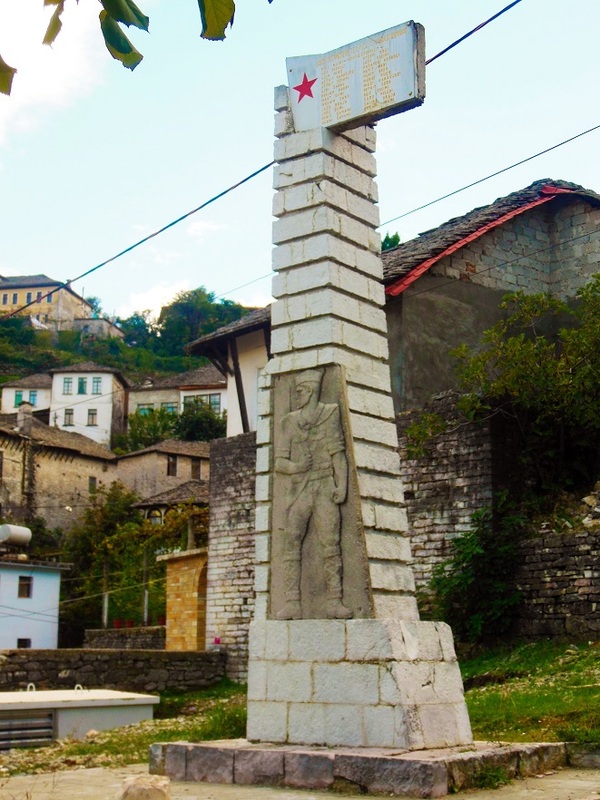 Gjirokastër’s historic architecture survived the communist era mostly un-scourged, though there are still ugly monuments like this about. 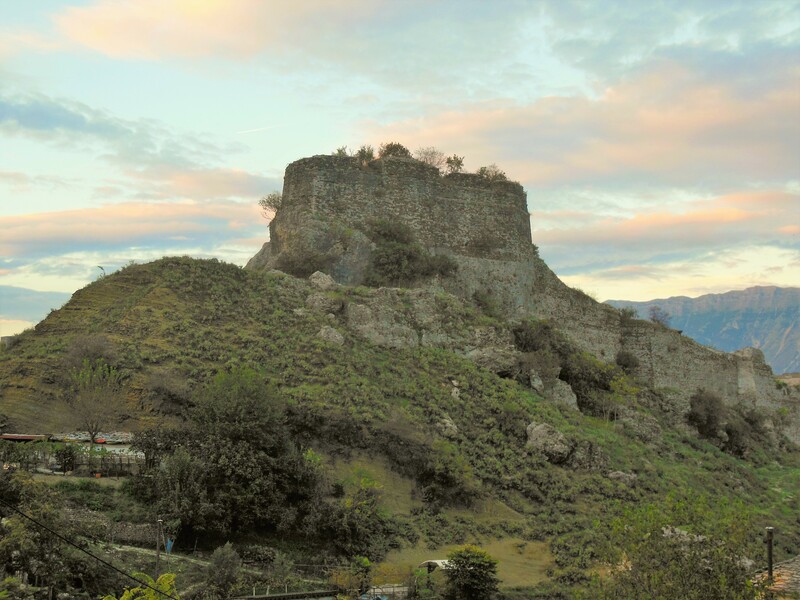 We did not visit Gjirokastër’s 13th century castle, but as dusk was falling we decided to walk behind it. The view was spectacular….until the sky turned black and we were lost in the dark with no clue how to return to our guest house. HOB finally admitted he was lost (and believe me, if he says he’s lost we are really lost. We were standing on a dark corner trying to figure out what to do when a man stepped out of a doorway and said “Are you lost? Can I help you?” And this most handsome, lovable man walked us over to a winding path and told us to stay on it, which we did, even when it turned into handrail-less stairway over a steep ravine until—finally!—we stumbled out into a more well lit street we recognized. 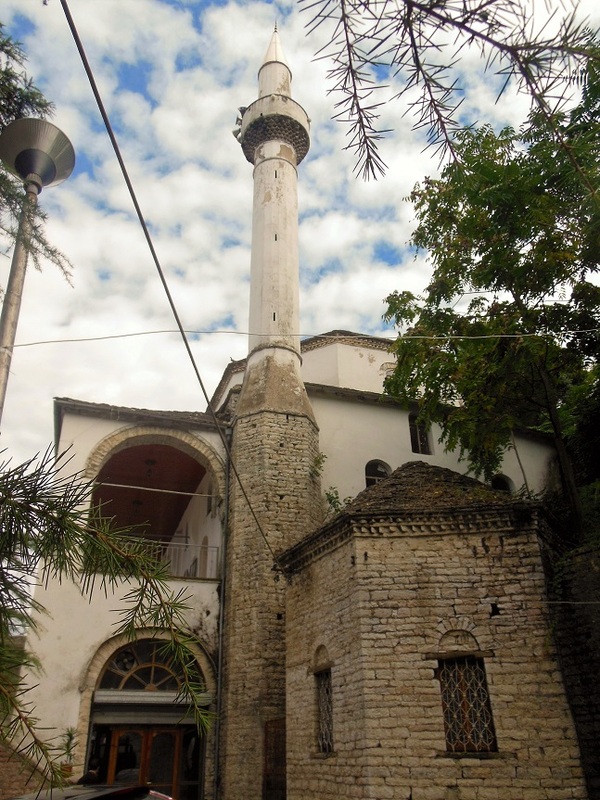 We got a chance to tour two extant Ottoman houses too. I’ll write a separate post about those because the details are so fascinating! 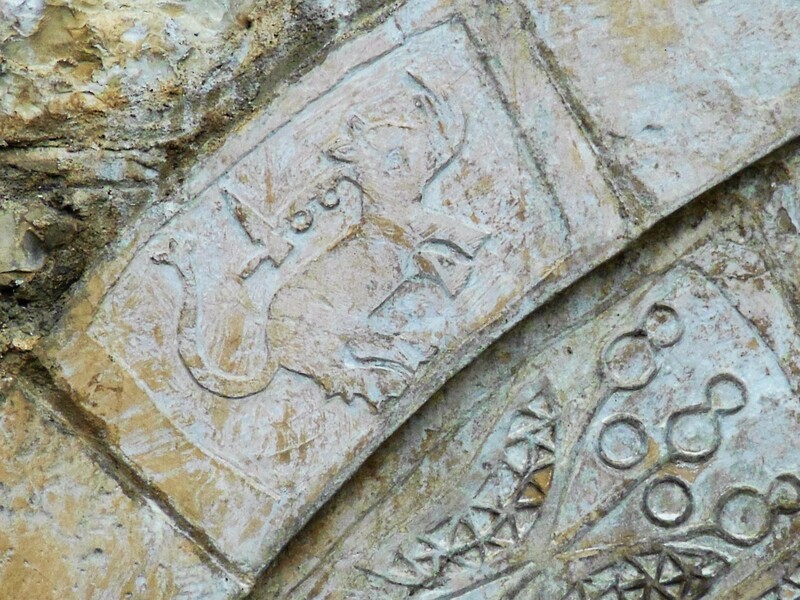 I wonder what that carving below the elephant is. The diners seem to be inside a post-Ottoman building; early 20th century? Yeah I’m not sure either but I am intrigued. I snooped on what all the people were eating and it looked delicious. Thanks for reading! 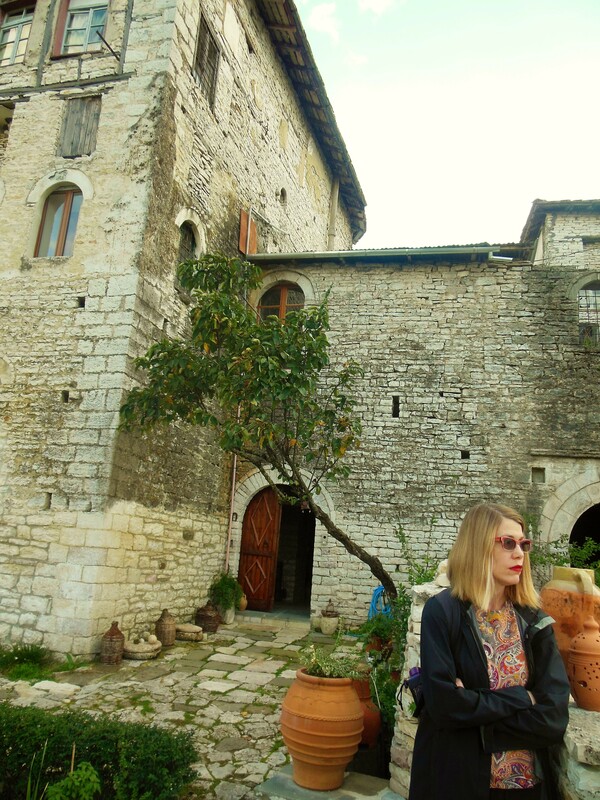 I do wish we’d had an extra day in Gjirokastër just to relax and watch the world go buy. I need to stay out of shops, though—too much temptation to buy things I can’t afford! Thanks for all your advice for visiting Albania Betsy. 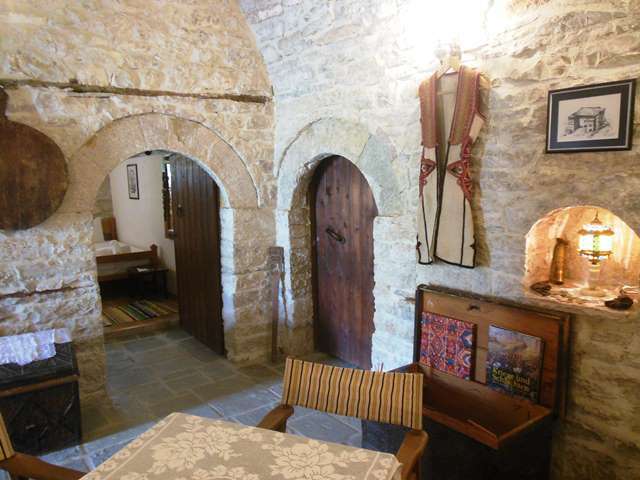 We stayed in the guest house you recommended in Korce and it was ideal. We didn’t here as much music as I would have preferred—have to go back for the folk music festival! It is so charming, thenomadicpanda. 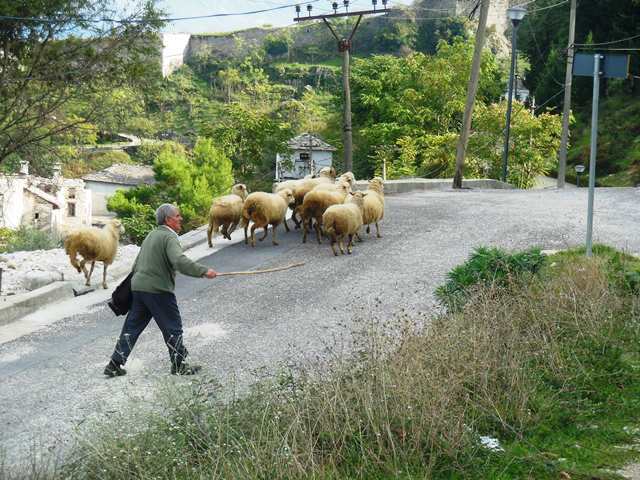 I was just thinking this morning about what a shame it is that so many places in Albania won’t allow photography—If more people could see how many cultural treasures Albania has tourism would surge!